Triple Play is the name given to three outstanding and versatile musicians, Peter Madcat Ruth (on harmonica, guitar, jaw harp, percussion & vocals), Joel Brown, (folk and classical acoustic guitar and vocals) and Chris Brubeck (electric bass, bass trombone, piano & vocals). Collectively they bring a rare level of joy, virtuosity, and American spirit to the folk, blues, jazz and classical music they perform. Triple Play’s musical roots go way back (nearly 40 years!) in each member’s history. Chris and Madcat have toured and recorded together in different settings since 1969, first as young rock musicians in the group “New Heavenly Blue” (with albums on RCA and Atlantic Records), “Sky King”(on Columbia), and then as jazz musicians touring the world with Dave Brubeck. Chris went on to form the group Crofut & Brubeck with the uniquely talented banjo player Bill Crofut and also featured Joel on guitar. A highly unusual and critically acclaimed CD, “Across Your Dreams” (Telarc) featuring famous mezzo-soprano Frederica von Stade singing songs written by Chris, Dave & Iola Brubeck. Their next project was the recording of the acclaimed “Bach to Brubeck” (Koch International Classics) at Abbey Road Studios with the London Symphony Orchestra. Chris Brubeck: Composer, orchestral arranger, lyricist and performer, Christopher Brubeck is equally at home playing jazz, rock, classical, funk and folk music, displaying his multiple talents on three instruments. An award-winning composer, Chris has been called “…a 21st Century Leonard Bernstein” by John von Rhein of the Chicago Tribune. Chris’s composition, “Vignettes for Nonet,” for woodwind quintet and The BBQ was commissioned by, and premiered at Bay Chamber Concerts, Rockport, Maine in August, 2003 to great acclaim. Since its premiere Vignettes has been performed by many woodwind quintets, including the Russian National Orchestra Woodwind Quintet. It is on the Brubeck Brothers Quartet’s new Koch recording, Classified, with the ASCAP award-winning woodwind quintet, Imani Winds. 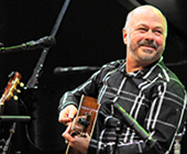 Guitarist Joel Brown’s actively eclectic performances as a soloist and chamber musician have included appearances with the Chamber Music Society of Lincoln Center, the Festival of Contemporary Music at Tanglewood, the Saratoga Chamber Music Festival, the Caramoore Festival, and the Killington Festival. Internationally, he has played in British Columbia at the Music in the Mountains Chamber Music Festival, in the Czech Republic at the Mikulov Guitar Festival as concerto soloist with the Martinu Chamber Orchestra, and in Asia with the Singapore Chinese Orchestra. Notable appearances in the United States include Carnegie Hall with soprano Dawn Upshaw, recitals on both coasts with mezzo-soprano Frederica von Stade, and with the Boston Pops Orchestra. Brown has also performed on NBC’s Today, CNN’s Showbiz Today, on NPR, and on the BBC. Brown is the founding member of Tritonis, a flute, guitar and cello trio that appeared at the Guitar Foundation of America conference in Miami, at National Flute Association conventions in New York and Boston, and in universities and recital halls across the nation. Brown also commissioned new music for their critically and internationally acclaimed CD, Five Premiers—Chamber Works with Guitar (Albany). 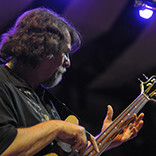 Brown performs regularly as a member of Chris Brubeck’s Triple Play, a crossover group blending jazz with blues and folk music. The trio has played in almost every state of the Union, and in 2006 performed at the Monterey Jazz Festival with the legendary Dave Brubeck Quartet. Their CDs—Triple Play Live and Watching the World (Blue Forest Records)—have won them fans around the world. Back in 1963, when Peter Madcat Ruth was a freshman in high school, he began taking guitar lessons at the Old Town School of Folk Music in Chicago. In 1964, his interest in guitar led him to an album by Sonny Terry and Brownie McGhee. Sonny Terry’s harmonica playing inspired Madcat to pick up a harmonica and play along. He’s been playing harmonica ever since. In his early years of harp playing, Madcat practiced along with whatever blues albums he could buy or borrow. He also listened to the blues live whenever he could at places like the University of Chicago, and Chicago’s Regal Theater. Too young to listen to the blues in bars, Madcat was a devotee of the Pervis Spann radio program on WVON, and the Big Bill Hill radio program on WOPA which featured occasional live broadcasts of blues performances from bars on Chicago’s South Side. 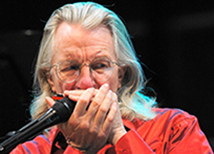 During high school, Madcat played harmonica with several local folk groups, and later with several blues bands. In 1968 he met bass player and trombonist Chris Brubeck, son of jazz pianist Dave Brubeck. The two met at a jam session and an instant mutual respect sprang up between them. Madcat told Chris to let him know if he ever needed a harmonica player. Shortly after this meeting, a surge of wanderlust sent Madcat on a two-year hitchhiking stint. He studied Spanish in Mexico, played in a jug band in Albuquerque, and worked in a day care center for the children of migrant farm workers in central California. He also spent a lot of time by the side of the road playing harmonica. In the spring of 1969, Chris Brubeck tracked Madcat down in New Mexico and invited him to join his rock band, New Heavenly Blue, in Michigan. For the next two years, Madcat played with the band summers and weekends while attending Lake Forest College in Illinois. In 1971, he left college and moved to Ann Arbor to work with the band full time. Playing with New Heavenly Blue enlarged Madcat’s musical experience. Many of the tunes the group performed were in unusual time signatures such as 5/4 and 9/4. The group recorded two LPs: EDUCATED HOMEGROWN on RCA Records and NEW HEAVENLY BLUE on Atlantic Records. In 1971, Dave Brubeck wrote the cantata TRUTH IS FALLEN which featured New Heavenly Blue. TRUTH IS FALLEN was performed with various orchestras, among them the Rochester Philharmonic, the Cincinnati Symphony Orchestra, and the Dallas Symphony Orchestra. New Heavenly Blue also played the music for a touring company performing Jesus Christ Superstar; Madcat played all of the saxophone parts on the harmonica. When New Heavenly Blue disbanded in 1973, Madcat joined the Darius Brubeck Ensemble, a progressive jazz group led by Chris’s older brother, Darius. This was a tremendous education for Madcat, who found himself playing harmonica with a horn section composed of clarinet, trombone, saxophone and harmonica. The Ensemble was often billed as opening act for the Dave Brubeck Quartet. At these concerts the performers from both groups would usually jam together on stage to close the show. Now Madcat was performing with such jazz greats as Gerry Mulligan and Paul Desmond, as well as Dave Brubeck. In 1974 when the Dave Brubeck Quartet disbanded, Dave invited Madcat to join the his new group: Two Generations of Brubeck which featured Dave, and his sons Darius, Chris, and Daniel. At the same time Madcat joined Chris Brubeck’s new rock group, Sky King. In 1975, Sky King released the album SECRET SAUCE, on Columbia Records, and made an extensive U.S. tour. And so for a few years Madcat spent almost all of his time on the road playing jazz and fusion rock with the various members of the Brubeck family. One night, Madcat played at New York City’s Bottom Line Cafe with Sky King early in the evening, dashed uptown in a taxi with Chris between sets to play with Dave Brubeck at the Newport Jazz Festival (held that year at Carnegie Hall), and made it back downtown in time to do Sky King’s second set at the Bottom Line. With Two Generations of Brubeck, Madcat performed in concert halls and at music festivals in the U.S. and in Mexico, Canada, Germany, Austria, Holland, Australia, and New Zealand. Mexico was delighted with “El Gato Loco,” and Germany hailed “die Verruckte Katze.” Madcat recorded on three Dave Brubeck albums: TRUTH IS FALLEN, TWO GENERATIONS OF BRUBECK, and BROTHER THE GREAT SPIRIT MDE US ALL, all on Atlantic Records. He also appeared with the group on the Mike Douglas Television Show on CBS, and on a National Educational Television Special filmed at Dave Brubeck’s home in Connecticut. In 1977, after ten years in other people’s bands, Madcat realized that the time had come for him to do his own music, on his own terms. For the next few years he returned to his folk music and blues roots, playing his music at colleges and coffeehouses throughout the Midwest. Often he performed as a soloist and on other occasions he would be joined with various back-up musicians, including drummer Danny Brubeck, and the amazing electric bassist Jason Boekeloo. In addition to performing his own music, Madcat accompanied many other musicians and played in an impressive variety of musical styles. In 1984, Madcat released his first solo record called MADCAT GONE SOLO, and for the next few years continued to pursue a solo career, performing at night clubs, civic auditoriums, college campuses, and music festivals throughout the United States. It was also during this time that Madcat started performing children’s concerts and school assembly programs. On August 23, 1997, Peter Madcat Ruth was named Harmonica Player of the Year by The Society for the Preservation and Advancement of the Harmonica (SPAH). The award was presented to Madcat at the 1997 SPAH Harmonica Convention held at the Crowne Plaza Hotel in Romulus, Michigan. SPAH is an international, all volunteer, non-profit organization dedicated to preserving the rich heritage of harmonica music, and advancing the appreciation of this very versatile musical instrument. SPAH currently maintains a membership of over 3000 harmonica players from all over the world. In 1998, Madcat again joined forces with his old buddy, Chris Brubeck. Along with guitarist Joel Brown, they formed the trio: Chris Brubeck’s Triple Play. Triple Play has performed in concert all over the USA, and has performed with several symphony orchestras. In the year 2000, Triple Play released their first CD: TRIPLE PLAY, LIVE which was recorded live at Skidmore College. Their second CD: WATCHING THE WORLD was released in 2003. TRIPLE PLAY LIVE AT THE ARTHUR ZANKEL MUSIC CENTER was released in 2011, and TRIPLE PLAY WITH THE SINGAPORE CHINESE ORCHESTRA (recorded in Singapore) was released in 2014. Go to the Triple Play Page. In 2006 Madcat won a Grammy Award for being a featured soloist on William Bolcom’s CD: SONGS OF INNOCENCE AND OF EXPERIENCE.